Within 250 miles of Atlanta, GA. The walls are the MOST MISSED OPPORTUNITY to drop time. Most swimmers don't know the key components of proper technqiue in turns and underwater dolphin kicking. Learn from two of the FASTEST swimmers IN THE WORLD at this swim clinic designed to take your swimming to the next level. Get ahead of the competition at this swim clinic focusing on teaching you the proper technique for FASTER WALLS. 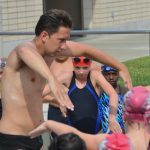 Work with Olympic gold medalist in freestyle Klete Keller and 100 butterfly National Champion Giles Smith to learn the drills and skills to improve. Flip Turns: Learn to carry your momentum through the turn to get ahead of the competition every wall. Klete Keller has an Olympic gold medal due to his discipline and focus when executing a proper flip turn. Practice drills and exercises to help you master this athletic skill. Open Turns: The open turn is often done incorrectly. Extra movements are added in that slow swimmers down. Keep it simple by spinning backwards and keeping your elbows in close. If you listen closely to Giles; he will show you how he became the fastest swimmer in the country through the turn. Underwater Dolphin Kicking: Absolutely, undeniably, the fastest way to move through the water! Let our Elite clinicians teach you how to make the most of your underwater kicking, as well as teach you drills on how to improve upon those skills. Strong and fluid undulations will allow you to blast throguh your underwaters to pass up the competition. Take your swimming to the next level and learn the details to racing faster! Work with Olympic gold medalist in freestyle Klete Keller and 100 butterfly National Champion Giles Smith to learn the drills and skills necessary to improve. The start sets the tone for the race, the turn allows you to maintain momentum, and the dolphin kicks blast you past the competition. Front Starts: Set the tone for a great race with a powerful, streamlined and fast start. There are countless intricacies to performing a great start and you only get better with practice. Learn Klete and Giles's tips to get off the block and into the water with speed and power so that you can begin your race ahead of the competition. Flip Turns: Learn to accelerate into the wall so that you can carry your momentum through the turn and get ahead of the competition. Klete Keller has an Olympic gold medal due to his discipline and focus when executing a proper flip turn. Practice drills and exercises to help you master this athletic skill. ASK QUESTIONS: Swimmers and parents are invited to ask Klete and Giles questions during a Q&A session. Gain insight into their training regimen, diet and nutrition, and recovery tactics. WATCH THE CLINICIAN: Observe Klete and Giles swim at full speed and demonstrate a progression of perfectly executed drills to achieve powerful, efficient and fast swimming. PUT YOUR SKILLS TO THE TEST: Practice what you've learned by swimming at top speed with some of the best swimmers in the world! Hold on to your form while having the opportunity to challenge yourself. Take a photo while wearing the Olympians' medals, get autographs, and receive a gift from TYR Sport! There are spots available in the hands-on coaches program. If you are interested in meeting and working alongside our elite clinicians during the clinic, please click the register button for the coaches program.